[Note: This guide is work in progress and will be revised and updated. Check back for updates]. Participants and competitors: Links to information on how to draw or upload your GPS track are available on the Routegadget NZ homepage. These links will be updated in the near future. rg.orienteering.org.nz provides an open Routegadget service for all NZ orienteering events. This guide is intended for clubs and event organisers who would like to upload their event to Routegadget. Generally, the faster you can upload the event onto RouteGadget following an event, the greater the number of people who will use it. Four pieces of information are required to setup an event in Route Gadget. Some of this (Background Map, Courses File, and All Controls Map) can be created before the event and kept confidential by the Planner/Controller until the event is completed. (For example, on a USB micro drive kept by Controller). Once the event is over and the results finalized, the Splits data can be generated and combined with the previously prepared files (or saved onto the USB micro drive) to upload the event onto RouteGadget quickly. These instructions assume the person uploading results onto the clubs website and adding the event onto RouteGadget will be different to the Planner/Controller of the event, however this may or may not be the case. Suggestion: always have multiple backups of your OCAD/CONDES course setting files. All Controls Map. (optional) This is one jpeg image file of the entire map area used by the event with all controls shown on it. (Optional – This is only used for reference during the setup process to ensure controls are overlaid onto the background map correctly. If the person uploading the event onto RouteGadget will have a printed copy of the all control map or can view it directly in OCAD then you can skip this step). Background Map. This file is generated by OCAD. It is a single jpeg image file of the entire map area used by the event without any controls shown. Ideally it will include copyright and map details. Courses file. This file is generated by OCAD or CONDES. It is created from the OCAD/CONDES event setting file and is generally also used by OE2003 to create the courses. 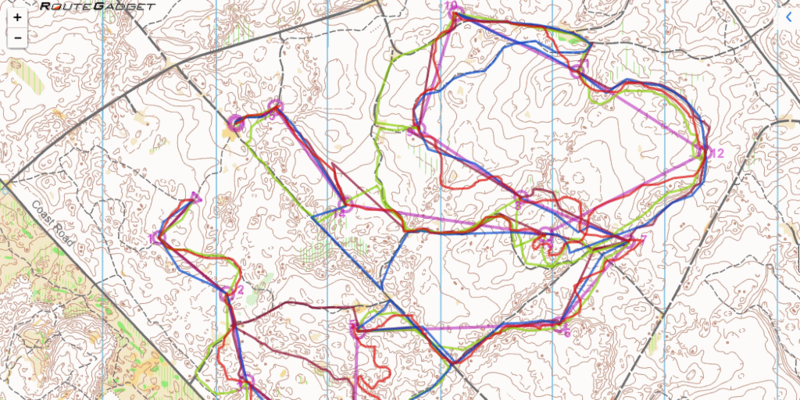 This file tells the software where each control is located on the map, relative to each other, and the course details. Splits file. This file is generated by the event software OE2003 after the event has concluded, and similar to what is uploaded to the winsplits website. It contains all the competitors, split times, and results. (Optional – This is only used for reference during the setup process to ensure controls are overlaid onto the background map correctly. If the person uploading the event onto RouteGadget will have a printed copy of the all control map or can view it directly in OCAD then you can skip this step). The Export Panel will appear on the right hand side. Tick the partial map box and use either of the three boxes beside it to specify the area being exported. E.g. click on the Entire map button and then drag the defining edges to limit the area to be included, making it as small as possible to include the area used. The Export Jpeg File file save window displays. Is as small a file as possible to reduce download size, without loss of detail when magnified. Tick the partial map box and use either of the three boxes beside it to specify the area being exported. E.g. click on the Entire map button and then drag the defining edges to limit the area to be included, making it as small as possible to include the entire area used. This file tells the software where each control is located on the map, relative to each other, and the course details. Export courses data as XML format: (“File” / “Export Data” / “XML”) – choose IOF XML 2.0.3 format. Note: Routegadget does not support IOF XML 3.0 Format. Please export “IOF XML 2.0.3 format” for course data. In the right hand side Courses panel, In the Course drop down box select All controls and click on the Preview button. Reset the location of the control letters, as if they are not in their default location problems will occur later on when you try to align everything in routegadget. The Export Courses (XML) file save window displays. The Controller checks the results and finalises the results. Once the results have been finalised and approved, they can generate the results for publishing on the club website and the splits file for upload into winsplits and routegadget. This is created after the event has finished. The Select Report window displays. The Split Time Results window displays. The RouteGadgetManager login web page will display. Enter the username and password and click “OK”. The RouteGadget Manager Menu will display. Click the Link “Add new event”. The Adding new event page will display. Select the appropriate radio button for each section and click “OK”. The Adding new event page will display based on the options selected. The results of the upload of the files are displayed. Click on link “Adjust controls on the map”. The RouteGadget java application starts and displays the background map on the left and control panel on the right. In the Control Panel Choose Competitors section, change the “Choose class/course” drop down box and select “All controls”. The control circles are shown on the map. Zoom by clicking on the +/– zoom buttons so you can see all of the controls. There may be some outside the map area. Align the control circles into their correct position on the map. Click the center of one control on the top left side of the bunch of controls. Click the center of the correct position of that control on the map. Click the center of one control on the bottom right side of the bunch of controls. On completion, the control circles will reposition on the map. You can zoom in and out during this process by clicking on +/-. You can drag the map by clicking the mouse on a blank part of the map and dragging the map and then releasing the mouse. If you click and release on the same spot of the map it will assume you are selecting the position. If something goes wrong, you can start adjusting from the beginning by reloading the page in your browser. If you accidentally close the browser window or need to redo it, go back to the Managers menu, delete the event, and add it again. Check all controls are positioned correctly and click “Save”. The Select courses for classes page displays. For each course, make sure the correct class/course from the results file is selected. Logout OK! will be displayed. The Routegadget Menu is shown. Test the event is working correctly. The list of Events in Routegadget appears. Paste the address as the address in the results of your website. Test the link works as expected. http://www.routegadget.net/download.cgi Home of the software. Downloads and Updates to latest version. http://www.routegadget.net/ List of websites with routegadget installed.